• Simple installation: rolls out where needed. • Ultrasonic sealed edges with spaced eyelets. • Lightweight, moveable & reusable with proper care. 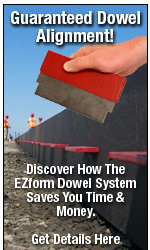 • Helps prevent naturally occurring heat developed from curing concrete from escaping into the atmosphere. Cold weather concrete insulating blankets. 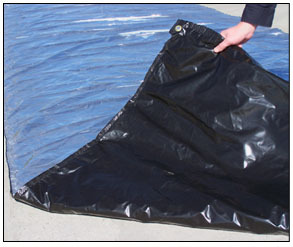 Patent pending PolarCure™ insulation blankets are comprised of thick natural cellulose fiber layers sandwiched by one layer of reflective coated polyethylene (one surface only) and one layer of black polyethylene. The blanket is designed for the black layer to absorb as much natural heat as possible from the concrete, while the reflective layer helps reflect this heat back into the blanket. The natural cellulose fabric in these insulation blankets consists of airlaid cellulose fibers with a target basis weight of 340 grams per square meter and a target thickness of 10 mm/ply. The edges of the insulation blankets are continuous ultrasonic sealed with eyelets spaced periodically for use as tie downs or to tie the blankets together. 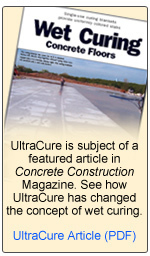 The excellent “R” value reduces the energy consumption for curing concrete by preventing the heat of hydration from the curing concrete from escaping into the atmosphere.